Swap - Bring on the Bling! 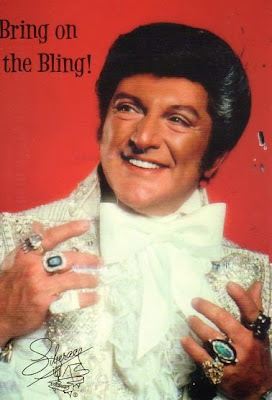 Thank you to Sybil for adding this fantastic Liberace postcard to my collection! I love it! 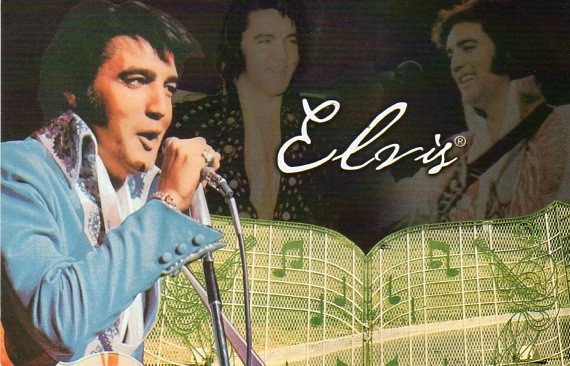 Thank you to Alexander for this awesome Elvis postcard! 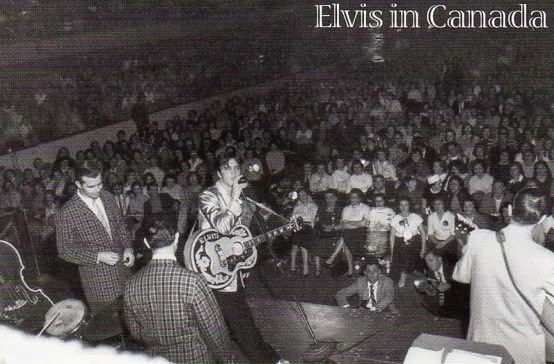 From his show at Maple Leaf Gardens, Toronto, Ontario, April 2, 1957. 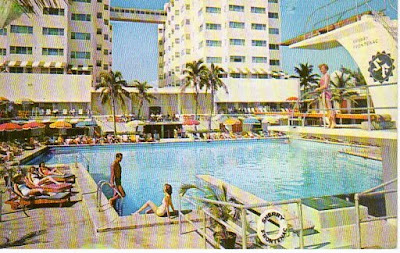 Miami Beach, Florida's Sherry Frontenac boasts it has Florida's most beautiful swimming pool. 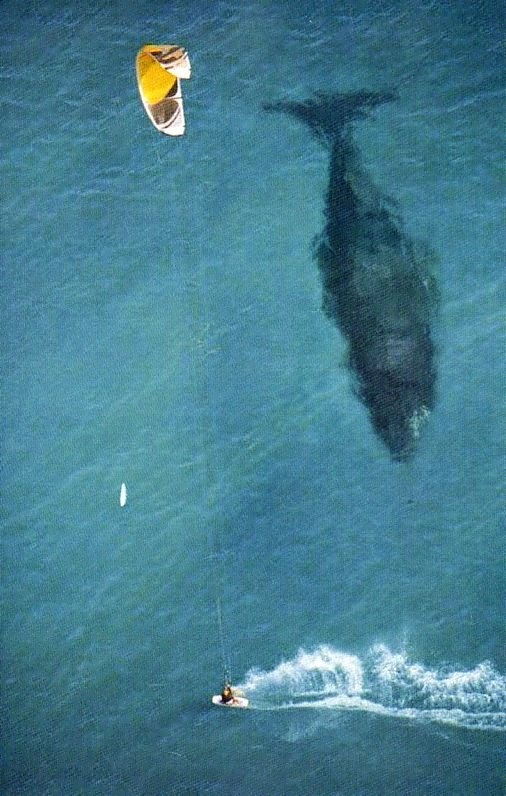 More beautiful than than nature's swimming pool at it's back door - the ocean? Eric had the good fortune to spend a weekend in Washington recently. 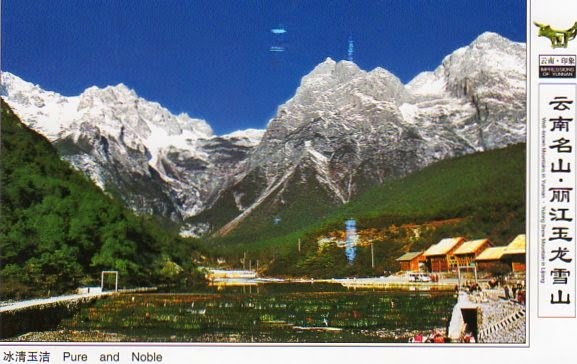 I had the good fortune to be the recipient of this (my first) lenticular postcard. 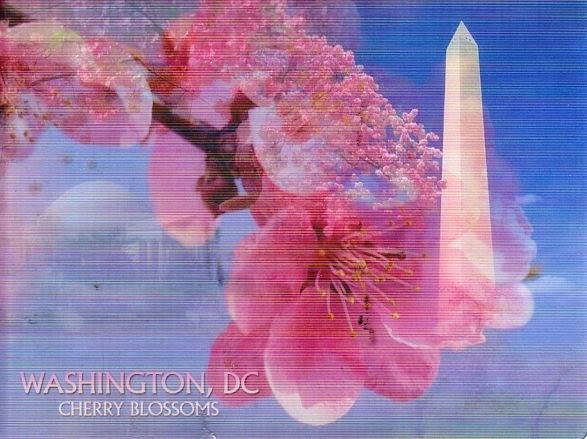 It's a beauty, complete with matching cherry blossom stamps! Love it!!! 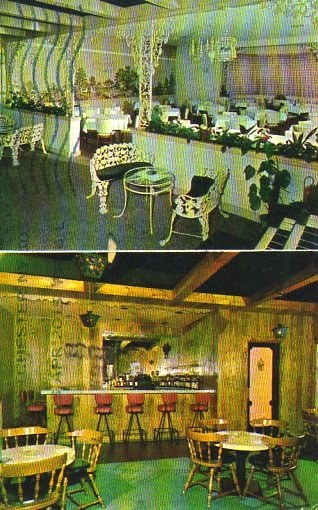 Rocky has very kindly sent me this delightful postcard from the Hotel Concord, the Garden Spot of Pennsylvania. You know there are some things you just cannot unsee...look at that delightful mix of wood paneling and white iron and chandeliers. I want to think that this is two completely separate restaurants but it is in fact the "lovely Plantation Room" located in the heart of grape country. 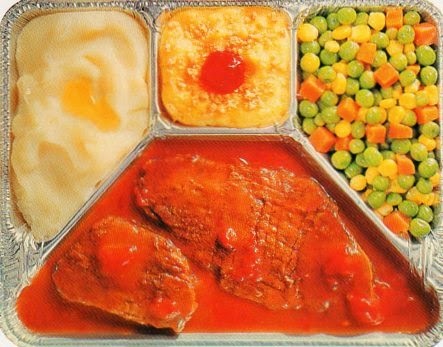 I imagine you walk in and a hostess asks you if you would like the dining room side or the bar side. How on earth would one ever choose?! Shout out to Arthur F Schultz for the fine furnishings and the Original Baumann Bros. for the luxurious carpet. Sort of a cross between Elvis and Bruno Mars actually. This card advertises a culture festival from Northern Europe. Thanks to Sarah for this fun card! Swap - The Big Chicken! Here it is... the very first postcard I fell in love with upon joining Postcrossing. Now it is mine! 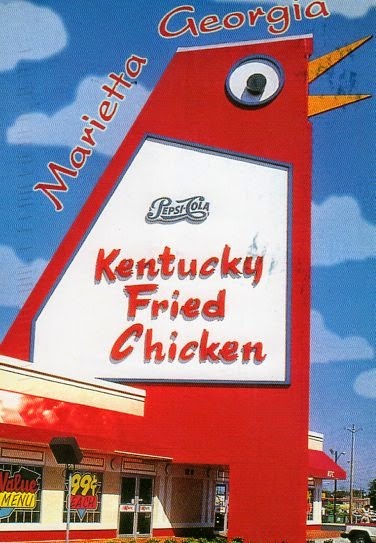 This is the "Big Chicken" located in Marietta, Georgia with beak and eyes that actually move. Denise writes that she wishes she had a dollar for every time she has been told to "turn right at the big chicken". 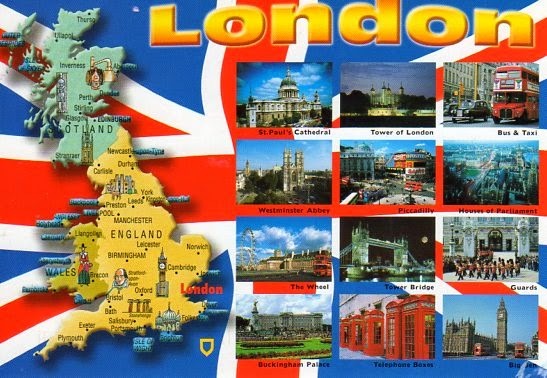 Thanks so much for this fantastic postcard Denise! Wonderful addition to my Elvis collection from Colleen! Love it! Thank you! Isn't he dapper? Girls everywhere dreamed of being his bride including Leena's sister. "That did not happen" writes Leena. Great card and great message! Thank you Leena! 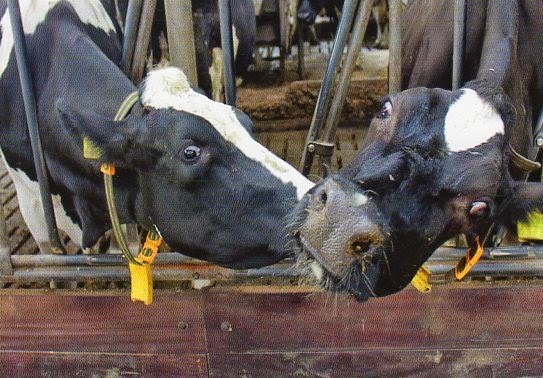 I love these cows from Tina! Look at that view! I am sure that if I ever make it to Hawaii I won't come back. Would you blame me? 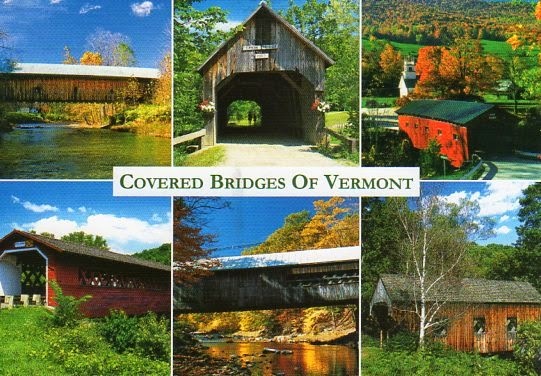 I received this wonderful multiview postcard showcasing the fine bridges of Vermont from Joy. I love it. The bridges here were all constructed between 1870 -1902. Love it!! Wonderful multiview and map from Dorothy. Thank you! Seems my swap pal Barbara in the US has many great Canadian cards I've been wanting for my collection. 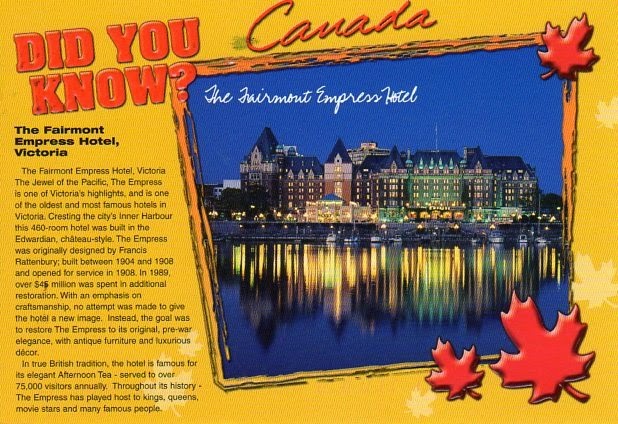 Love this one of Victoria's Empress Hotel. Famous for it's elegant afternoon tea, this hotel maintains it's original pre-war elegance thanks to careful restoration. 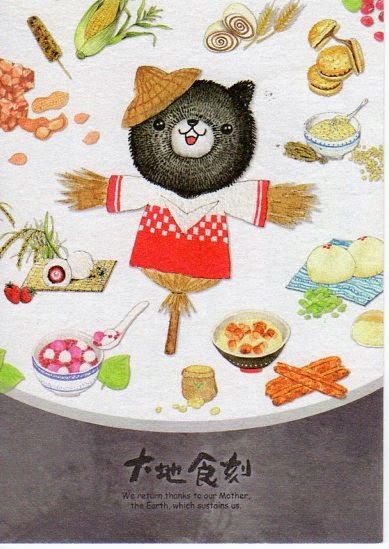 Super adorable postcard from Elaine showcasing yummy foods from Taiwan. 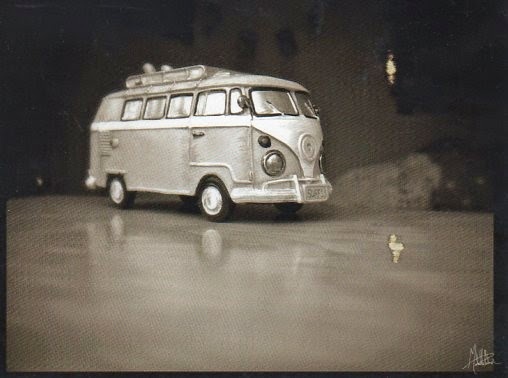 Darling little toy VW camper van from Anja. Cute! 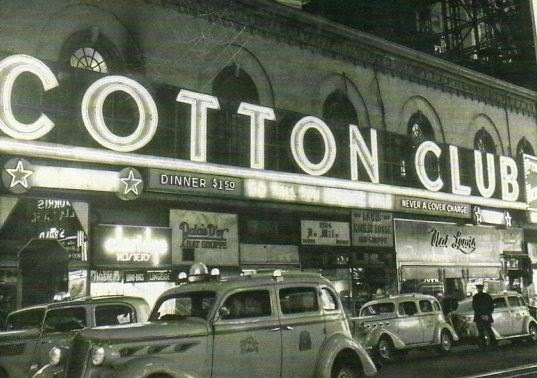 The legendary Cotton Club in New York City. Spectacular scenery in Hong Kong. 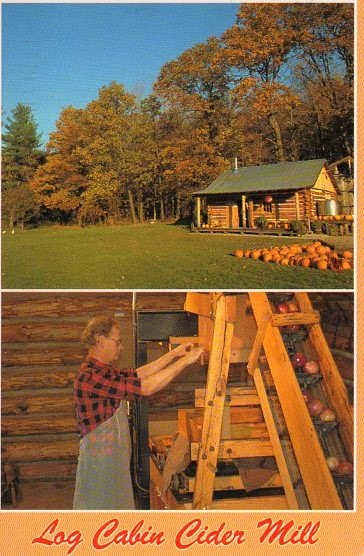 This postcard showcases apple pressing at one of the few cider mills now operating in New York state. Thank you to Alicia for this one! 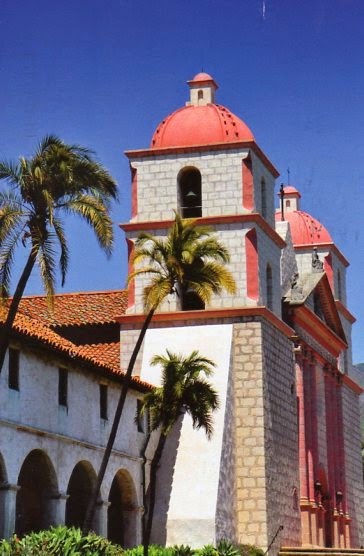 This mission is one of the oldest Spanish buildings in California. Isn't it lovely? 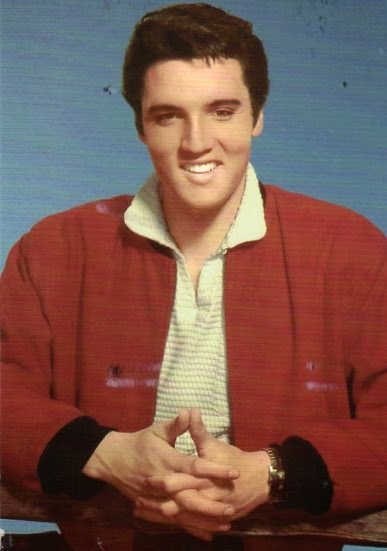 Another fantastic Elvis postcard from Rocky! Many thanks! Nom nom nom. Thank you Christine for this brilliant postcard! I can taste it now! No trip to Memphis is complete without a drive alongside the Mississippi River. 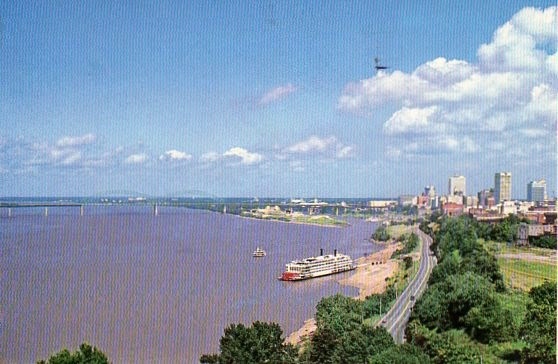 This view shows the Memphis skyline, the Hernando De Soto Bridge and the Mississippi Queen. Lovely! Hey look, it's Andie McPhee from Dawson's Creek! Love it! She was one of my favourite characters on that show. Thank you Sara! Mamma Mia, this girl's day is made! 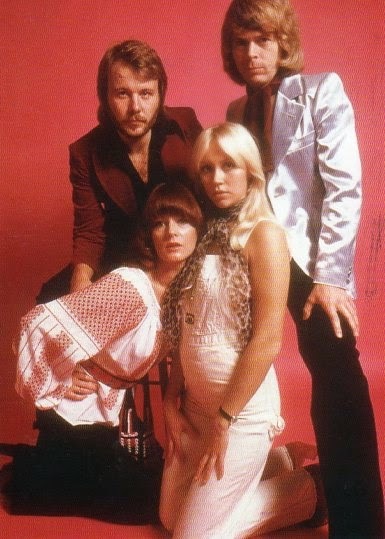 Finally, an Abba postcard in my collection! This one is from Abba The Museum in Stockholm (I don't have a bucket list, but if I did... this would be on top!) 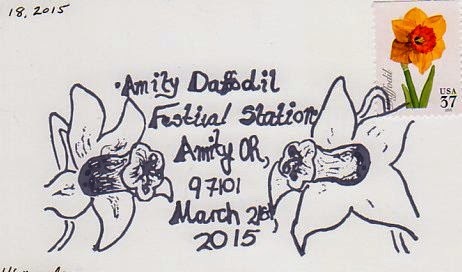 courtesy of Dina who visited there and loved it. Dina, I'm glad you could Take A Chance on Me and swap! That is the most insane cancellation I have ever seen... it is huge! Beautiful but huge. It takes up over half the postcard and I love it! Thank you for another great swap, Eric! 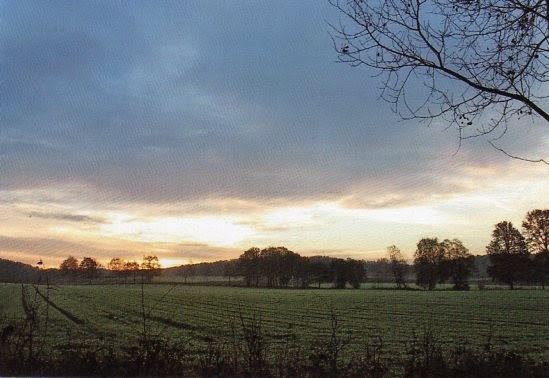 This is the view near Maike's home in a small village as photographed by her husband. How serene. Art by Natali Lipin. Beautiful! 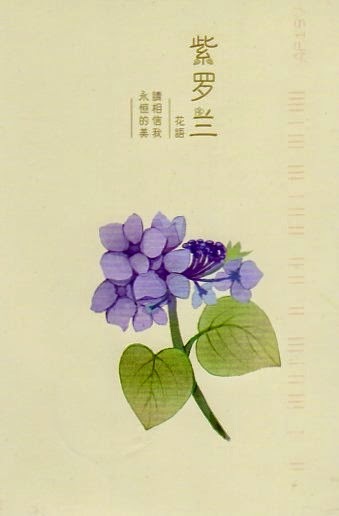 Lovely violets from Saki who explains that violets mean "trust me" and "forever beautiful". 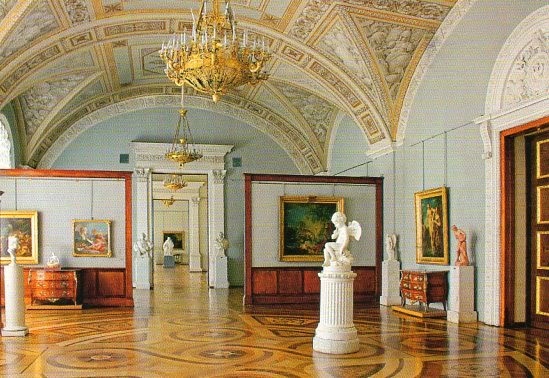 Once the home of Russian monarchs the Winter Palace now forms part of the complex of buildings housing the Hermitage Museum. 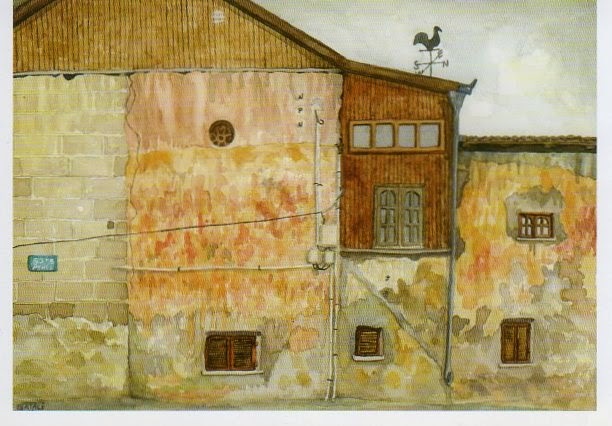 Shown here is the Hall of French Roccoco Art. 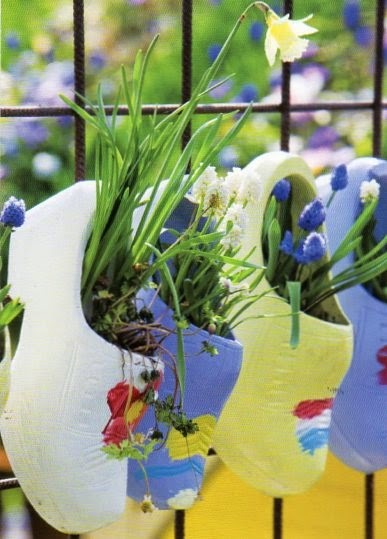 A very cheery spring card from Martha in the Netherlands. She writes that this is a common site. Thank you, Martha! 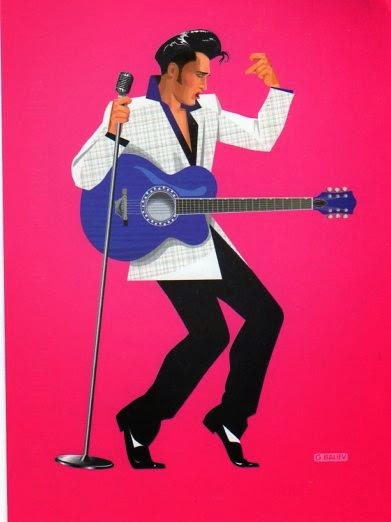 Another fantastic Elvis card ,,, this one is from Valerie! 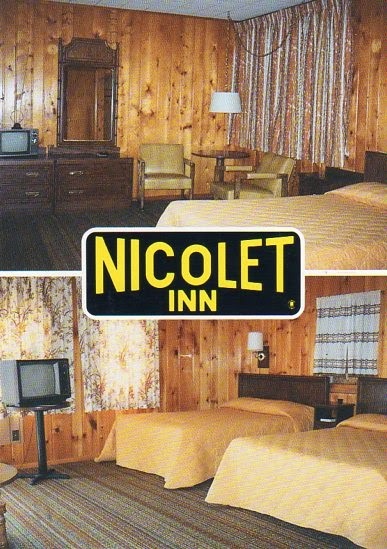 The fantastically stylish Nicolet Inn, located in Mackinaw City, MI. Heated pool, air conditioned, electric heat, colour/cable. Some kitchenettes, 1, 2, & 3 room units, carpeted, showers, some with combination tubs. Close to restaurants and ferry docks. Five minutes from public beaches. Pets accepted. Across from Travel Information Center. Thanks to Paige for this awesome gem! Look at the sea of "harvest gold" in that room. Those awesome drapes! I really love this card! 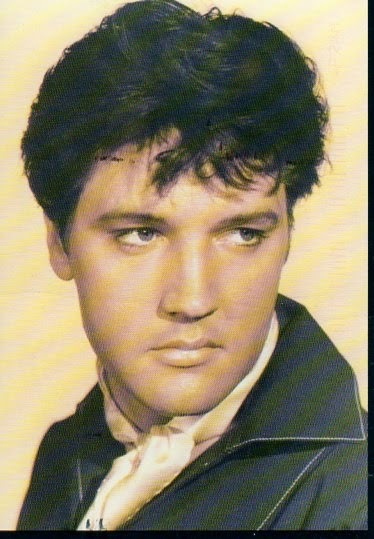 Aurelliana saw this fantastic Elvis postcard and sent it to me. Isn't it fabulous? I've never seen this one before so I'm really excited to add it to my collection! Thank you so much! She also used a postage stamp which she had printed from one of her acrylic paintings and it is just gorgeous! 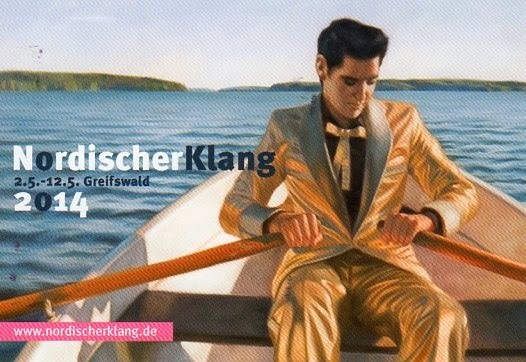 Fantastic Elvis illustration by Gamid Baliev. Thank you Vladzimir for sending this one to me! 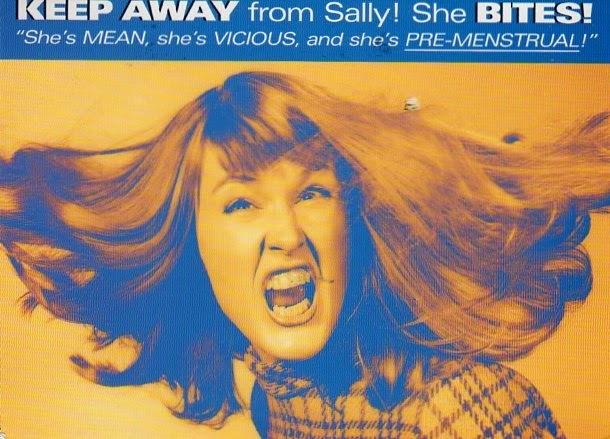 Swap - Keep Away from Sally! I laugh *every time* I look at this card! Thank you Jennifer! 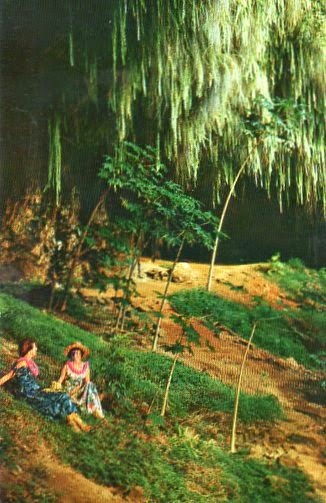 Fern Grotto, Kauai is the picturesque climax to a scenic boat trip up Wailua River on the verdant river of Kauai. 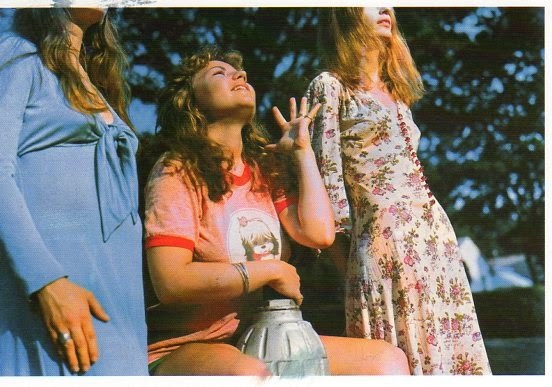 "I imagine the Brady Bunch just off the scene there discovering the tiki idol with their curly hair (which I read was caused by the humidity while they were filming)." 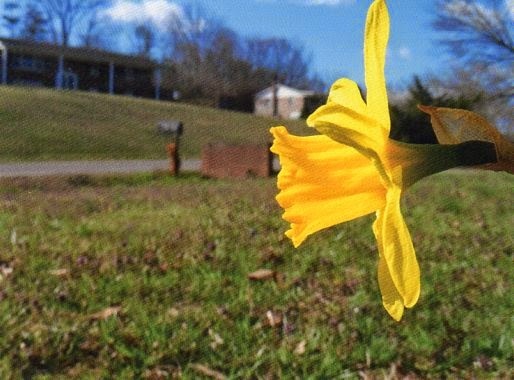 The stellar photography work of William Eggleston. I love his stuff! Thank you, Regina! 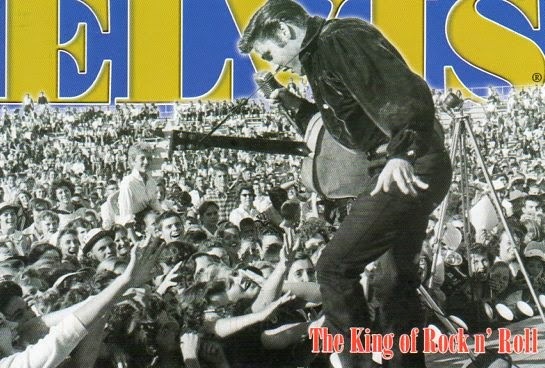 NA RR April 2015 - Elvis! 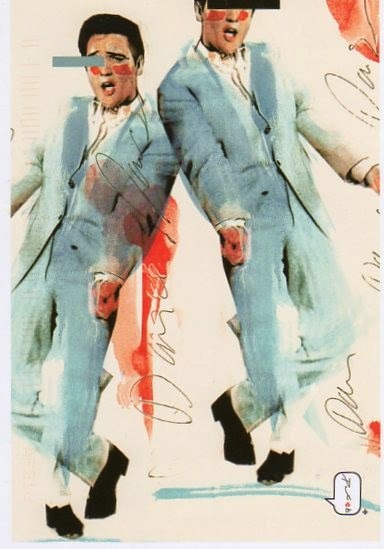 Another fine Elvis card from Davida. Love it! Thank you! 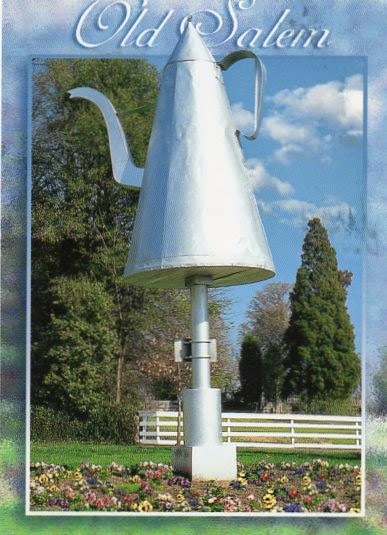 The giant coffee pot is located at the northern entrance to the Old Salem NC historic district and is the city's best known landmark. The coffee pot was built in 1858 to advertise the business of Samuel and Julius Mickey. Another wonderful vintage card from my ongoing swap with Barbara arrived today. The Continental Alta Mira. "It's truly Heaven on Earth... Alta Mira nestles like a jewel in a setting of the Hills of Sausalito. 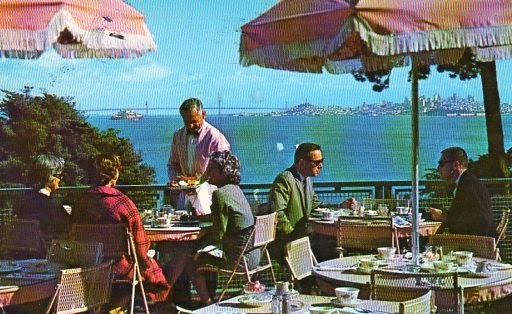 Dining on the Terraces is spiced with added enjoyment of the glorious sweeping panoramic view of San Francisco, the East Bay Cities, The Bay Bridge and all of beautiful San Franciso Bay." The hardware and general store is a favorite meeting spot for townsfolk to catch up on the news about their neighbours, spin a yarn or two, an drink a soda. 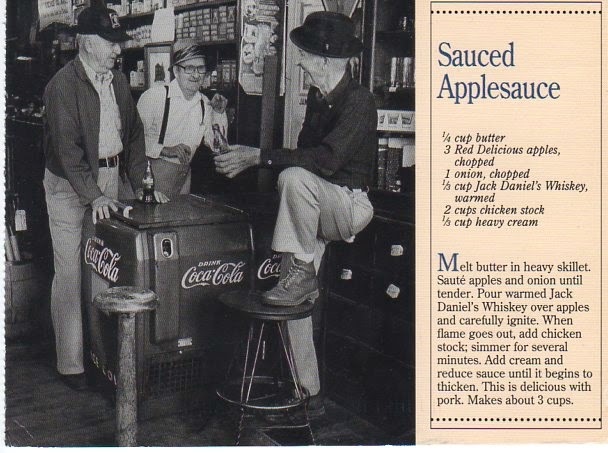 Recipe from the Jack Daniel's The Spirit of Tennessee Cookbook. I love this great retro kitchen scene from Theda! 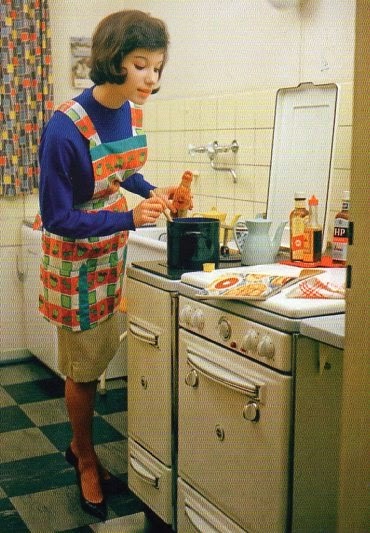 What do you think she is cooking up with her HP Sauce and her Worcestershire sauce? Here is a fantastic postcard from Eric of the Shahabbas Hotel is Isfahan, Iran, circa 1975 when he and his family stayed there. 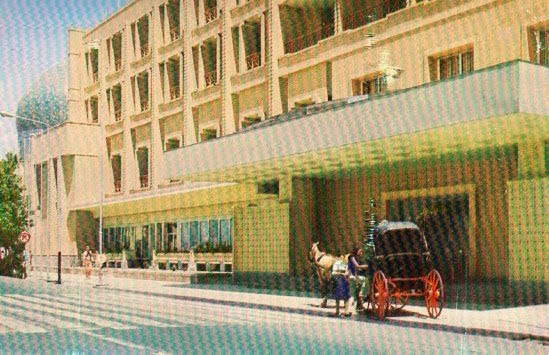 Originally constructed over 300 years ago it is now known as the Abbasi Hotel. 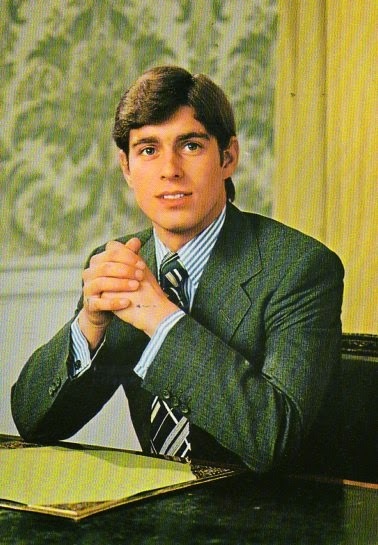 Eric even treated me to a bonus Iranian stamp on this card... or was that just to confuse the post office? Another gem of a card from Jason this month - Sky Motel. Friendly, clean, comfy country inn located on the east end of Drummond, Montana. Stop in and "trade a little bull" with the friendly management. Phones - King and Queen sized beds - kitchenettes. Not to mention, HBO and two pepsi machines! 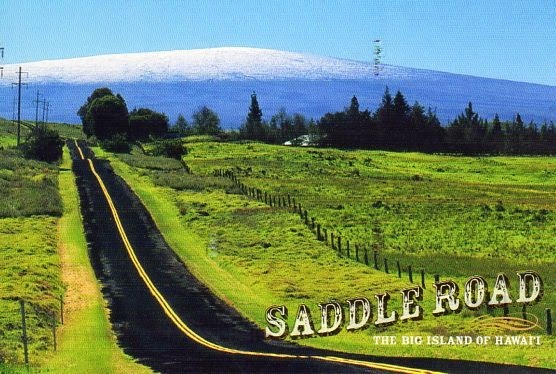 Great postcard from Hanna! 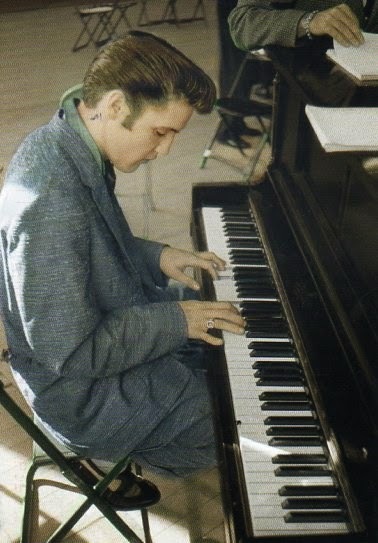 Colorized photograph by Alfred Wertheimer. 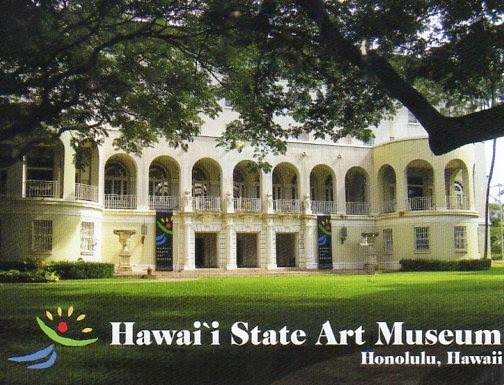 A Spanish-Mission style structure built in 1928 this museum is comprised of three spacious galleries. Formerly known as the YMCA and the original site of the Royal Hawaiian Hotel. RAS - Elvis... 35th Anniversary! Swap - They Were Young! They Were Wild! Swap - School House Rock! NA RR April 2015 - Multiple cards!